Keep important contact details on your Agency Contacts, status information and key watch list items of Policy Renewal Dates. Manage schedules and keep track of activities, capture notes, record emails and much more! Designed for insurance professionals, Insurance Database for Act! is a customized Act! Pro database for the Insurance industry. It helps you take control of your business and effectively manage your client relationships. Centralize your Contacts and Policy Details for Easy Organization. Keep contact information at your fingertips using a database and corresponding layouts designed specifically for insurance professionals. About Act! Contact and Customer Manager : Act! is the #1 best-selling Contact & Customer Manager for over 25 years. 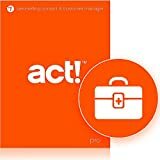 Act! is the trusted software solution to help individuals, small businesses, and sales teams. Organize prospect and customer details in one place, send emails, market products and services more effectively, and drive sales results.